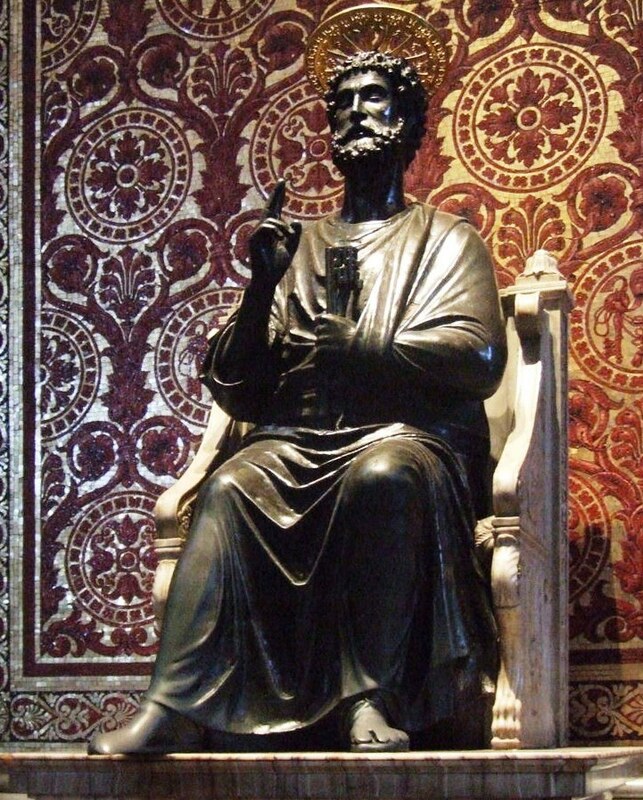 On the two feast days of St Peter, the feast of his chair on February 22nd, and the principal feast on June 29th, special decorations are put up in the Vatican Basilica. (This was formerly done also on the feast of St Peter’s Chains on August 1st, and on January 18th, back when there were two feasts of Peter’s Chair.) 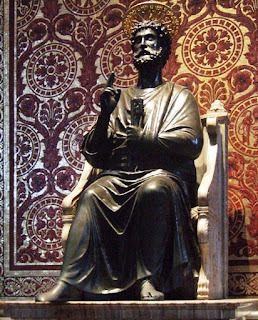 The bronze statue of the Apostle attributed to Arnolfo di Cambio (1240 - 1310 ca. ), made in all likelihood for the Jubilee of 1300, is dressed in pontifical robes similar to those formerly worn by the Pope. Here is the statue as it normally appears; the feet are famously worn down by the constant kissing and touching of the faithful. And here it is “dressed” for the feast day today. The altar is decorated with two bronze statues of Saints Peter and Paul, donated to the Vatican Basilica by the family of Pope Urban VIII Barberini in 1692. 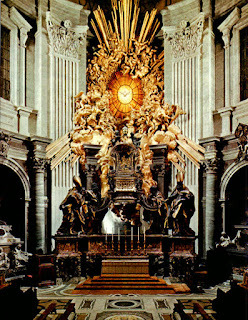 The enormous sculpture of St Peter’s Chair by Bernini at the back of the Basilica is covered with candles. Here we see the Chair as it normally appears, in an older photograph that also shows the former altar of the Cathedra beneath the sculpture. Two other views, the second of which also shows the modern altar, which in the reign of Pope Benedict replaced an earlier (and comically ugly) free-standing altar installed in this same part of the Basilica. The feast of St Peter’s Chair is not only the commemoration of his ministry as chief of the Apostles, but also the feast of a relic long reputed to be his actual throne. 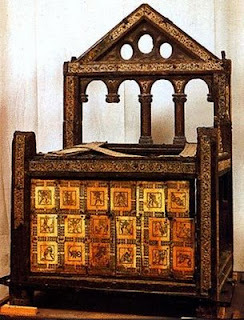 Although it never attained to the popularity of the Veil of St Veronica, the Vatican Basilica’s relic par excellence in the High Middle Ages, it was regularly seen and venerated by the faithful, being first explicitly named “the Chair of St Peter” in 1237. Before the long period of the Popes’ residence in Avignon, (during which many medieval customs of the Papal liturgy disappeared,) the Pope was enthroned on the relic for part of his coronation ceremony, and used it as his liturgical throne in the Basilica on the feast of February 22. 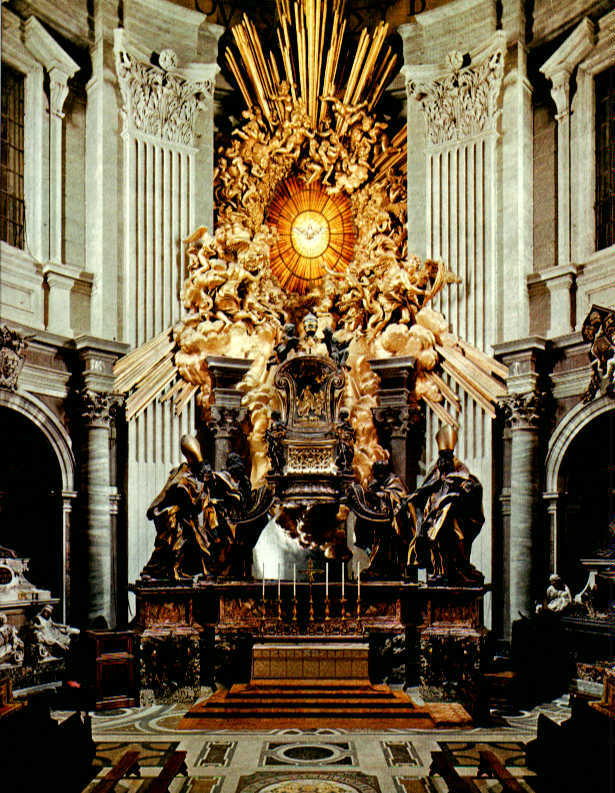 Its veneration continued through the Renaissance and the Counter-Reformation periods, but since 1666, it has been kept within Bernini’s Cathedra Petri at the back of the Vatican Basilica, and very rarely brought out. The very magnificence of the sculpture, and its presence as the visual culmination of the church, has overwhelmed its purpose as a reliquary; all the more so since the relic itself cannot be seen within it, and has so rarely been removed from it for viewing. It was last exposed in 1867, at the behest of Blessed Pope Pius IX, during the celebrations of the eighteenth centennial of the martyrdoms of Ss Peter and Paul. 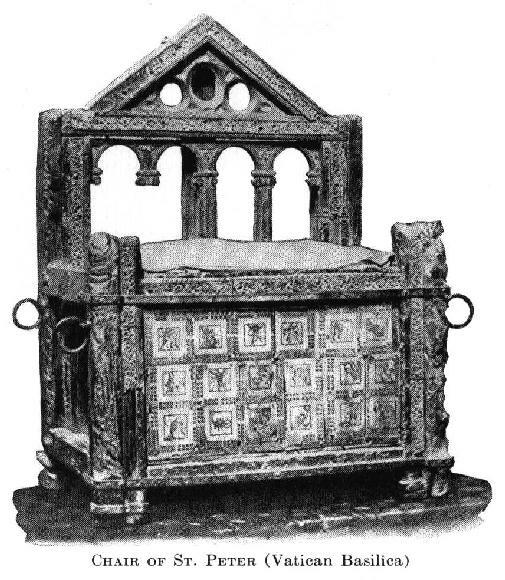 A copy (pictured below) is displayed in the treasury of St Peter’s, but with little to indicate the prominence which the original formerly held.